You might ask, what are some more traits that make up an ideal ColdFusion developer? Does my team have these qualities, and if not, can I train them? What is an Ideal ColdFusion Developer? How to Create an Ideal ColdFusion Developer? The best developers have a much higher output than their average counterparts. They don’t do the minimum amount of work to get by; they are always on the watch to do more with the time they have. Ideal ColdFusion developers are giving their all to be the best, and to move up the ladder to positions of more authority. Finding or developing a superior developer is worth the time and effort. Confident, but realistic, attitude – A positive attitude can take a burned-out and unproductive developer and turn them into a superstar. But, ColdFusion development is not all roses and parades. Your developers must be realistic and temper their positive attitude with a lot of realism and a bit of skepticism. A fake smile and a Pollyanna attitude will not help during a crisis. Clam and cool heads prevail. What questions can I ask to know if my developer possesses this trait? How do they get along with their coworkers? What kind of attitude do they have? Vast technical ability – Ideal developers know several technologies (CFML, HTML, CSS, SQL) at an expert level and are knowledgeable with many others. A good developer will be able to jump into any current project and be able to make a difference. They use the best of coding standards and conventions and aren’t lazy when it comes to making sure others can understand their work by commenting. They understand the use of version control options like Git and can work with ColdFusion helpers, testing, and support software. Does their past work show they operate at the highest standards? If they are new, what do their references say about them? What is the consensus among their coworkers about their quality of work? Open-minded and adaptable – An ideal developer embraces change . They need to be willing to consider opposing ideas and figure out ways to make them work. They need to adapt to the changing ColdFusion development environment and make the best of new and challenging situations. How have they handled rapid change in the past? Do they possess a big ego and forcefully argue their point, or are they open-minded when someone presents a differing idea? How does the developer handle difficult situations? Rapid and lifelong learner – An ideal ColdFusion developer is constantly learning and staying up-to-date on changing technology. When faced with something they don’t know, they use whatever resources they can to find out answers quickly and efficiently. They aren’t afraid of new technology. Instead they enjoy it as a learning experience. When faced with new technology, do they push back? Do they use their spare time to stay current and learn new things? Excellent communication skills – I am mentioning communication skills again because they are the key to being an ideal developer. The ability to absorb what someone is asking and immediately turn it into a useful task is priceless. Communication is essential for project managers and developers. This prevents misunderstood directions. Do they listen when someone speaks, or are they always considering what they will say next? After direction given, do they ask follow-up questions, so they know what it is they are being asked to do? Do they ensure their fellow developers understand the task at hand? 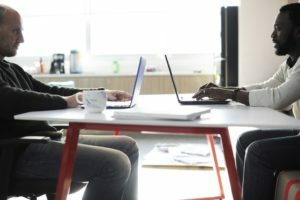 Productivity and speed – Being productive and working quickly go together. Knowing how and when to be productive is the mark of a quality developer. Knowing when they are in the flow, or they need a break to recharge is important. Finishing a task swiftly is often helped by how well a developer works without distractions. Is the developer full of energy, or always burned out? Does the developer work in the time where they are in the flow or push through even when they need a break? Awesome memory and intuition – Memory and intuition will help your developer to know how to do something difficult, and when. Intuition can be the difference between them stressing over a piece of code or knowing the answer immediately. Good memory and intuition will often help them innovate and come up with solutions that no one else thinks of proposing. Does the developer often know the answer to a problem before you explain the solution? Are they often the innovators of the group? True talent can often show up in the places you least expect. Sometimes the only difference between an average developer and an ideal one is the amount of direction they get, and the resources offered. 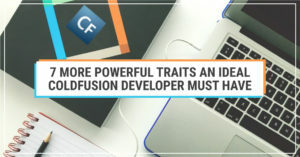 Between this article and the first, we have covered many traits of ideal ColdFusion developers. Remember to ask questions about your developers every chance you get to make sure you aren’t overlooking talent. Following these suggestions, you are sure to have a team full of ideal ColdFusion developers.